What is Good: Valentines Day Choo Choo Style - Giveaway! Valentines Day Choo Choo Style - Giveaway! There are a ton of giveways going on, click here for more details! I can't believe that Valentines Day is right around the corner, I am so excited! When I was little I loved passing out Valentines to all my friends. Now Alex, my two year old son, can get excited too. 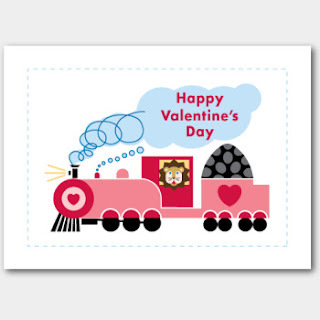 Alex is extremely thrilled about anything with trains and I found this adorable Valentine at Tiny Prints in their kids selection of cards and knew without a doubt that this was the one for us! Some of the cards are even printed on recycled paper, I'm going to feel so much better knowing that I'm saving some trees! www.tinyprints.com certainly has everything to make your Valentines Day special as well ~ Valentine's party invitations, cards for both adults & kids, photo cards and a selection of gift tags & stickers to help complete the theme. A $50 Gift Certificate to Tiny Prints for one lucky winner! Save your favorite Kids Valentine’s Card design in your account by clicking the “save in favorites” link. Leave a comment here on my blog with a link to your favorite Valentine's Day Card for kids and let me know why it is your favorite. For a valid entry you must leave me your email address and make sure it is the same one used to create a Tiny Prints account so participation can be verified. Come back and enter daily! My son LOVES everything pirate, he would love to give these Valentine's out at preschool! I love the Furry Friends card. I love the cupcake one. I like the one called the scoop. My fave is Passionate Pooch. I love that I can add a picture tot eh back. My favorite is the Swinging Sweathearts card. I really love this card. Really cute! I saved it to my favorites. My son loves fish and he calls every single one "Nemo"
It's just adorable and would be too cute to give out for my daughter's first Valentine at school. Thank you! I like the cool valentine because I think penguins are cute! Love the penguins "Cool Valentine". I like the Monkey Love style because I LOVE monkeys and have a special spot in my heart for lists. I did add it as a favorite under my account, but used the email cheyli @ hotmail.com, not the one listed in my blogger profile. I like the Enchanted Princess design. It's adorable. I love the Enchanted Princess design. i like the baby monkey. I like the Enchanted Princess design. Thank you! I like Monkey Love - because who doesn't love monkeys?? I saved the Ladybug Love one to favorites. My littlest granddaughter loves ladybugs and they seem to show up everytime she visits here even in winter. Love "the scoop" card it is our fav. I saved the Doggy Divine, although I also love Love Blooming, since we're getting a puppy in two weeks. My daughter would love this! Thanks! I love the Enchanted Princess design. Thank you!! I love the "Ahoy Matey" pirate-themed valentines. Thanks for the giveaway! I saved Cupcake Crush - I'm a pastry chef so this one really spoke to me. I'm following your blog! Thanks. i love scoop I'm having so much fun making friends and blog-hopping again this year. My favorite card was technically smitten. I'm going with the Enchanted Princess again! lol Thank you!! My favorite is"Encanted Princess"http://www.tinyprints.com/products/ProductView_5671.htm It reminds me of my daughter. I love tiny prints! We have ordered Christmas cards through them the past 2 years and have been so pleased! I saved "Your a Tweet Friend"/Furry Friends as a favorite. It's the Love Charms card. It's so cute and unique. I saved Furry Friends to my favorites! I love the Enchanted Princess! It's perfect for my little princess. The love charms is my pick. I love the pink and brown combination! I love the Enchanted Princess design. It reminds me of my beautiful 4 yr. old daughter. they are both too cute! Thank you!! I saved "Swinging Sweetheart" to my favorites. I like the furry friends print because my daughter loves all of her furry friends! I love the Enchanted Princess design. It would be perfect for my daughter's first Valentine's Day in school. Thank you!! Entering one last time for the Enchanted Princess design. Thanks again for the giveaway! I love the Cupcake Crush SUPER CUTE! Thanks for the chance to win a great prize. http://www.tinyprints.com/products/ProductView_5689.htm which is the Lovable Lion. And, my registered e~mail addy with Tiny Prints is the one you see below. I love the Cupcake Crush Valentine's Day Card because it's so cute! The email address I used for Tiny Prints is ms.lilyk@gmail.com.